We've been dying to get our hands on a decent docking system for Mac notebooks, so we were like children at Christmas when we unboxed the Henge Dock. 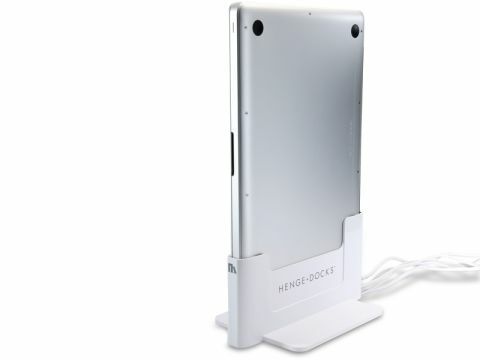 Henge Docks turn your notebook into a desktop system without you having to faff around reconnecting your keyboard, mouse and screen when you bring it into your office. Instead, you lower it into the dock onto the row of connectors. And because the Mac stands vertically, the whole thing takes up very little space. The docks are model-specific and come with a load of port extender leads, which you leave clamped into the dock. To ensure each is attached in the correct place, you're recommended to attach them one at a time, which can take a little while, but you only do this once. Getting the Mac in and out of the 13-inch MacBook Pro dock we tested is easy enough, even with a full complement of connectors – though you need two hands, one to hold the base and the other to lift out the Mac. It doesn't come with a Mini DisplayPort adapter or MagSafe power connector, and with the latter lies a problem. Because you have to clamp each connector in, you ideally need a second power adapter to take on your travels or you'll constantly be unclamping and reclamping it if you need longer use than the battery will give you. We also worried about scratching the Mac's casing when sliding it in and out – a soft lining on the dock would have reassured us.